STORY: President of India’s main opposition Congress party Rahul Gandhi on Wednesday (April 10) filed his nomination papers in northern state of Uttar Pradesh. 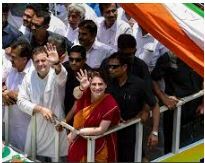 In a show of strength, Gandhi, flanked by his charismatic sister and Congress leader Priyanka Gandhi and her husband Robert Vadra, held a road show in Amethi constituency before filing his nomination papers. Rahul Gandhi was joined by his mother and Congress matriarch Sonia Gandhi when he filed his papers. Congress hopes the fourth-generation siblings of a dynasty that ruled India for decades after independence from Britain in 1947 and is still revered by many will help energize its ranks and counter Prime Minister Narendra Modi’s Bharatiya Janata Party (BJP).